Big Blue's Online Carburetor: Article from JULY 1, 2006 issue of Hemmings Motor News. Article from JULY 1, 2006 issue of Hemmings Motor News. This article originally appeared in the JULY 1, 2006 issue of Hemmings Motor News. The engine that gave the iconic Beetle its soul. Volkswagen's flat-four might be one of the simplest engines ever produced, but there was nothing simple about the path it took to production. An Austrian engineer's persistent dreams, inspiration from an iconoclastic Czechoslovakian designer and enthusiastic support from one of the most reviled dictators in history all played a role in birthing this enduring engine. As Europe struggled to emerge from the worldwide depression of the 1930s, Ferdinand Porsche's head was filled with ideas for an inexpensive, durable car for the masses. What Porsche needed was a reliable patron. Zundapp, the motorcycle manufacturer, wanted to get into the car business, and hired Porsche to build a prototype. Porsche suggested an air-cooled, horizontally opposed engine, similar to those that Hans Ledwinka had designed for Czechoslovakian automaker Tatra, but Zundapp specified a water-cooled radial five-cylinder, which turned out to be a failure. Porsche's engine designer, Josef Kales, then designed an air-cooled engine for a high-volume, low-priced car that NSU wanted to build, but that company lost interest, too. It took the support of Adolf Hitler to get Porsche's car for the masses built. The car, named the KdF-Wagen (for Kraft durch Freude, or Strength through Joy), was offered to German workers through a savings plan. 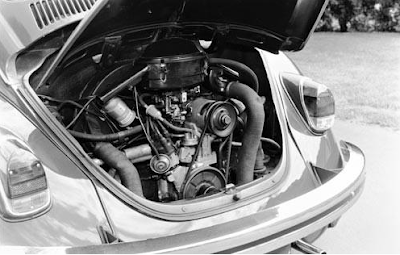 To power the car, Porsche tried a two-stroke vertical twin and a pair of horizontal twins, all air-cooled, before returning to his idea for a flat-four. Franz Xavier Reimspiess's reworking of Kales's design emphasized economy and reliability above horsepower. 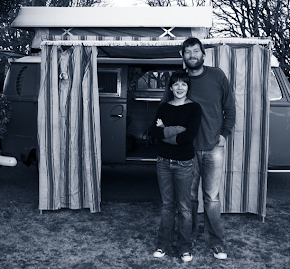 A split alloy crankcase reduced weight, a cast-iron crankshaft with three main bearings saved money, and a single four-lobe camshaft--each lobe operating opposing valves--brought simplicity. Each side of the engine had a single, aluminum cylinder head bridging two cast-iron cylinder barrels, the assemblies held in place by studs threaded into the crankcase. The camshaft was located in the center of the block, gear-driven off the crankshaft. Pushrods were enclosed in steel tubes, pushing against shaft-mounted rockers to actuate the horizontally oriented valves. A radial fan, enclosed in a steel cowling, was driven off the generator, which was itself driven off the crankshaft by a rubber belt. The fan forced air down over the cylinder barrels, and across the oil cooler mounted to the fan's left--oil as well as air provide the cooling in an air-cooled engine. A long manifold connected the inlet ports with a single Solex carburetor. When crankshafts broke in testing, the cast iron was replaced with forged steel. Sure, it made only 22.5hp at 3,000 rpm, but it could run at maximum speed on low-grade fuels all day long. VW rose from the rubble of World War II on the strength of the little car, now named the Beetle, and went on to manufacture more than 22 million of them. Over the years, displacement was increased several times, from 1,192cc to 1,285cc to 1,493cc, and, finally, 1,584cc. The maximum power rating was just 54hp--not something you were likely to learn from VW's omnipresent advertisements. 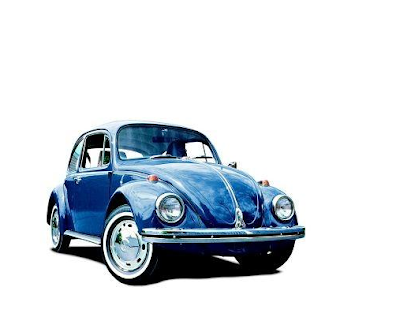 The last original Beetle was produced at Puebla, Mexico, on July 30, 2003, but it wasn't the last air-cooled VW. 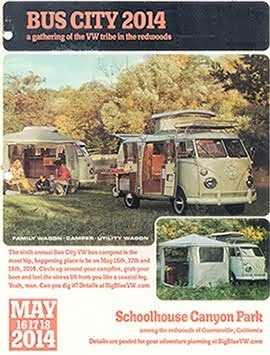 That distinction belongs to a microbus that rolled off the assembly lines at Sao Paulo, Brazil, on December 23, 2005. When Hitler took over Czechoslovakia they stole all the know-how from Tatra. That's why VW had to pay huge damages later in 60's for stolen intelectual property. You are correct on the fact that it was taken from Tatra, but it was stolen before Hitler invaded Czechoslovakia. The invasion stopped the lawsuit Tatra had filled. "The matter was re-opened after WW2 and in 1961 Volkswagen paid Tatra 3,000,000 Deutsche Marks. These damages meant that Volkswagen had little money for the development of new models and the Beetle's production life was necessarily extended."